Karen Bovenmyer, Mur Lafferty, Rich Dansky, and Maurice Broaddus collaborate on a tale during the Storium Live panel. This morning I got up early and headed down to the convention center to stand in line for the press room. I got there 45 minutes before it opened at 7:30 a.m., and since I was one of the first 90 people, I was able to get a ticket for admission to the Exhibit Hall an hour early. Of course, there weren’t just 90 people waiting in line—since people who pay extra for Gen Con VIP tickets and those who attend Trade Day also get early access. The line stretched all the way down the length of the exhibit hall and out to the skywalk to Lucas Oil Stadium. But it moved fast once the doors opened at 9 a.m. I spent the next several hours wandering the exhibit hall, mainly visiting various booths that had signed onto the “Cheese Weasel Con Quest” scavenger hunt promotion, in which you get a card punched or scan QR codes with a smartphone app in order to complete a registration for a drawing at the end of the convention. I saw a number of interesting games, as usual, and got the quest completed in just a few hours. 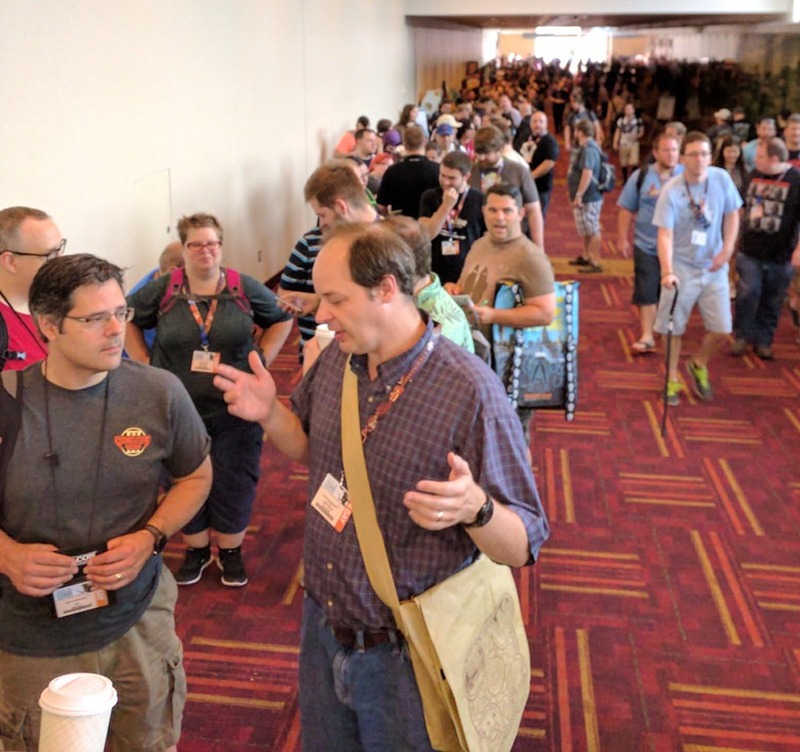 But as the afternoon wore on, I found the time to look up some events at the Gen Con Writer’s Symposium and head down to Event Registration to get tickets. I was able to get most of the events I wanted with no problem—pretty good for not bothering to sit down and work out what events I wanted to attend up until then. So I headed over to the Westin—where the Writer’s Symposium is this year—to attend a couple such events. But what these panels represent is really remarkable. These panels represent renowned authors giving advice on their art and craft to an eager audience. The “Realism” panel featured Robin Hobb and Jo Walton, among others, and Baen editor Jim Minz was on “Write What You Know.” And those are just the names I recognized—I’m sure the other names would be just as familiar to people who read a bit more widely in horror and romance genres. One of the panelists said she had gotten her start in writing by attending past Gen Con Writer’s Symposiums and picking up tips from all the writers there. The Writer’s Symposium is really one of the best values of the convention, and a reason why even non-gamers might want to consider coming. 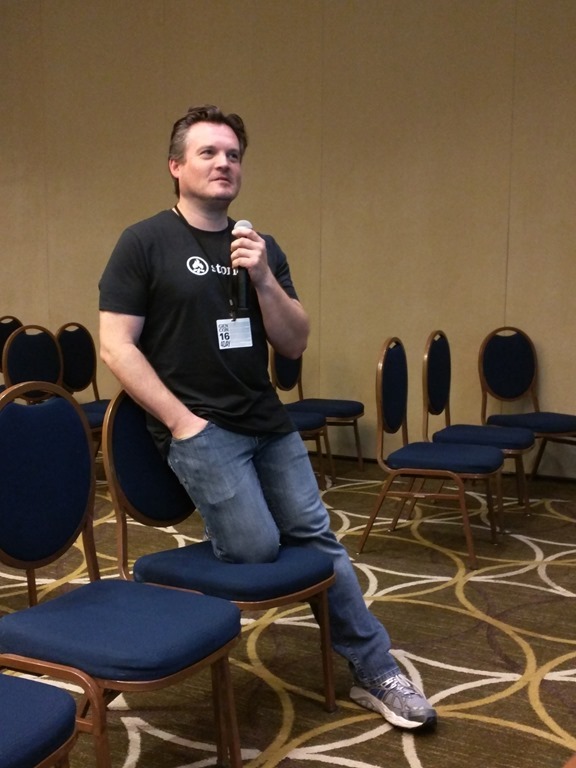 You could go from writing panel to writing panel all weekend long and never even go near a game session. And, needless to say, a lot of self-published and small-press authors and artists find it worth their while to come and set up in the exhibit hall, where they can meet and greet the tens of thousands of people who file through every day. The final event I attended this evening was a two-hour “Storium Live” session to raise money for Patrick Rothfuss’s “Worldbuilders” charity. It made use of the Storium play-by-post writing framework I’ve mentioned here a few times before, in which authors take turns writing and can use a system of story cards to influence the outcome. The “Storium Live” panel I attended last year was fairly bizarre and more than a little raunchy. This year’s session was much less raunchy, but very nearly as bizarre. 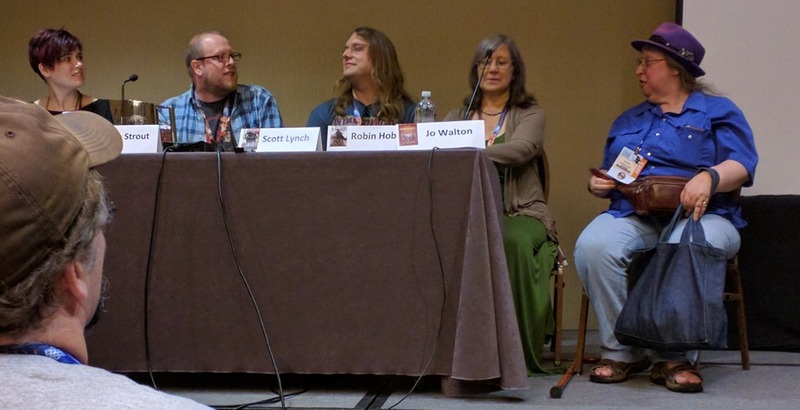 Moderated by Storium co-founder Stephen Hood (right), the game featured authors Karen Bovenmyer, Mur Lafferty, Rich Dansky, and Maurice Broaddus taking turns writing a story live, while the authors shouted encouragement and occasionally paid money into a Worldbuilders donation chest to influence the course of the story. If you want to read what was written, the record of the game is available to the public, though it may be one of those things where you just had to be there. Many bad puns were made, much silliness was committed, a lot of money was raised for Worldbuilders, and much fun was had by all. And that was Gen Con day one for me. I’m definitely looking forward to the rest of the weekend. Next Next post: Is an iPad still worth it for ebook lovers?